Our “Strengthening Families” series is all about the many ways you can build and maintain strong family togetherness. In this series, we will talk about age appropriate parenting strategies, how we can increase communication within the family, and the importance of playing with our children. Raising children doesn’t come with an instruction manual, and as a parent you may not have the answer to every situation. There is no one size fits all approach to parenting. Parenting comes in many forms and that’s okay! What’s important is what we do when faced with a situation where we aren’t quite sure how to act. Do we react to it or are we responding? 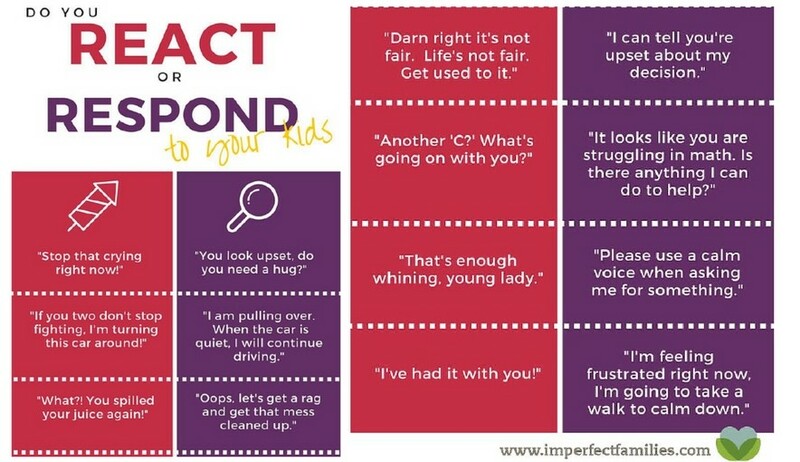 Using the graphic below, we can start to understand the difference between reacting and responding to our children. The pink boxes are examples of reactions. The purple boxes take the same situation and respond to it. Parenting strategies and approaches vary from culture to culture. In India for example, it is common for children to sleep in the same room as their parents until they are 6-7 years old. Think about how different this is from the United States, where it’s most common for children to begin sleeping in their own rooms as infants. There is clearly a cultural difference between these parenting practices however both practices produce safe, healthy children. It’s important to respect these differences, rather than assume they are wrong or harmful. Not every culture has the same views on how to raise their children, but what’s important is that each child is safe and healthy. Positive parenting promotes healthy development, but not all parenting practices are positive. Parenting strategies can be thought of on a range from positive to abusive or neglectful. Next time your child is throwing a tantrum, isn’t listening, won’t go to bed, or is being argumentative, consider how you approach the situation. Will you react to it, or respond to it? Register for this webinar “Get Kids to Listen without Nagging or Yelling” to learn new and effective parenting strategies by recognized parenting coach, Amy McCready. In this DVD, Jim Fay and Charles Fay, Ph.D. talk about simple Love and Logic parenting techniques showing how to get kids to listen the first time, avoiding power struggles, helping kids cope with bullying, etc. Check out parenting expert, Alyson Schafer’s website featuring several books on parenting strategies and advice.